The Sara Restaurant offers breakfast, lunch, and dinner halal menus (a la carte) and 24-hour room service for all guests staying in one of our fine guest rooms. Our Pad Thai (stir-fry Thai noodles) has received the Thai Government SME award for best Pad Thai and is highly recommended to all those seeking a truly delightful experience. Aside from being a popular restaurant in Bangkok, the Sara Restaurant has gained international attention by being featured on overseas television shows, like Makan Boomz in Singapore. The Sara Halal Restaurant opens daily from 6:00 AM until 10:00 PM along with 24-hour Room Service. All Food and Beverage services certified halal by the Central Islamic Committee of Thailand (CICOT). The Canal Restaurant is the Nouvo City Hotel’s latest addition of service quality excellence building on the reputation of our former Cafe de Canal. The Canal Restaurant offers 100% halal buffet breakfast and lunch daily with the possibility of booking for private functions as well. A warmly decorated atmosphere complete with dedicated buffets, a live demonstration station, and views of the historic Banglamphu Canal running alongside the hotel, the Canal Restaurant is the area’s premiere choice for family-friendly dining. The Canal Restaurant opens daily from 6:00 AM until 10:00 AM for halal buffet breakfast and 11:30 AM until 2:00 PM for halal buffet lunch. Timings may be subject to change to accommodate private groups. Daily halal buffet lunch is available at the great price of only 490 Baht per person! Price is inclusive of taxes and service charge. 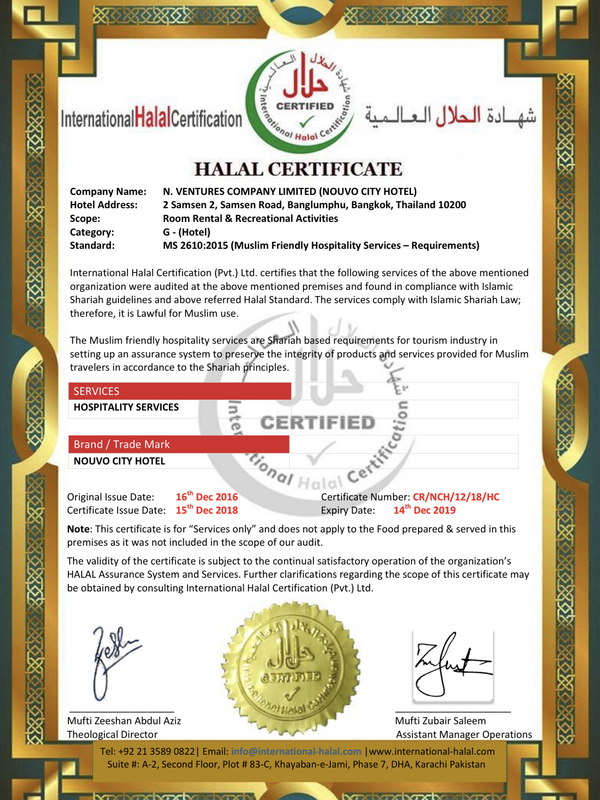 All Food and Beverage services certified halal by the Central Islamic Committee of Thailand (CICOT).